US rock band the Nine Inch Nails are giving away a second new album online, just two months after the first. The 10-track record, called The Slip, is available for free from the band's website "as a thank you to our fans for your continued support", they said. In March, the group released nine songs from their instrumental album Ghosts I-IV for free on the site, with the full 36 tracks costing $5 (£2.55). The group sold more than 10 million albums in the US between 1992 and 2007. But they have been outspoken critics of the music industry and the price of CDs. 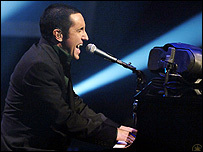 Singer and songwriter Trent Reznor has attacked his former record label Universal for "ripping off" fans, and once told a crowd to "steal, steal and steal some more". The band's deal with Universal has now ended, but The Slip will still be coming out on CD, Reznor said. "For those of you interested in physical products, fear not. We plan to make a version of this release available on CD and vinyl in July." The move follows the pay-what-you-like offer to download Radiohead's latest album In Rainbows and Coldplay's recent decision to give away the first single from their new album.